Welcome to the Range Backpack pattern inspiration and resources page! You can purchase the PDF version of the Range Backpack here in my shop now, or check your local quilt shop for the paper version (coming soon!). I thought it would be super helpful to have a designated page for helpful information, inspiration and resources for this pattern! I’m always eager to share variations, where I buy my favorite fabric and hardware, and any extra tips or helpful information to make your backpack sewing adventure a successful one! I’ve seen a few sewists missing Step 2j. Here’s an illustration to help understand what Step 2j is, just place the ZPP directly on top, simple at that, then move to Step 2k. If you’ve mistakingly done this it’s a very easy fix of ripping a few seams and starting at 2j. Hope that helps! Resources (also located at the bottom of page 2 of your PDF – with clickable links): Shop local when possible! This is an expanded form of what is included in the pattern. Solid cotton canvas: I’m a huge fan of Robert Kaufman’s Big Sur Canvas, it’s a beautiful weight (9.6 oz.) for bag making and comes in so many gorgeous colors. I want to substitute quilting cotton for my Exterior fabric requirement, what should I do? Here’s what I recommend (this is a little bit more of a chatty laid-back form of what I recommend in the pattern): Quilting cotton requires a bit more interfacing and stabilization than my preferred choices (canvas/waxed canvas), but I totally understand that there’s a much larger selection of beautiful quilting cottons readily available. So for this pattern I recommend interfacing the quilting cotton Side Panels and Front Panel using a medium-weight fusible interfacing, I use Pellon 809 (trimmed by 1/2″ smaller on all sides to keep the bulk out of the seam allowances). After the interfacing is fused, I baste (using a 5.0mm stitch length around the entire perimeter) cotton canvas/duckcloth to the wrong side of those same pieces. I find after these steps the quilting cotton is going to hold it’s shape really well. The canvas/duckcloth will stabilize the quilting cotton and won’t be seen in the final backpack, so I typically choose a natural color. The Back Panel is where you can either do the same method as the other panels, or you can quilt it. I have a section on page 4 of the PDF detailing information on how I quilt mine and what I use. Click the link below for a quilting tips video. Check out the Quilting Tips video for quilting the back panel of the Range Backpack! Cork fabric: This is the first time I’ve used cork fabric and I really enjoyed it. It’s become quite popular amongst bag makers and for good reason. It’s easy to use, doesn’t require interfacing, and comes in so many classic colors as well as bright colors and patterns even. I’ve purchased mine from Stitch Supply Co. and Sew Sweetness, and my local quilt shop (Olive Juice Quilts) carries a nice selection, too. Hardware: I have a small supply of limited edition kits available in my shop. Otherwise I’ve purchased from SewingSupplies on etsy or Emmaline Bags has a nice selection, too. Want to try a different closure? I have a video tutorial on how to use a side release buckle (as well as sources linked) on your next Range Backpack. Let’s hang out! Check out the Noodlehead Sewing Patterns facebook group. If you love talking sewing and bouncing ideas around for your next project, please stop by. 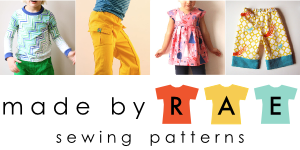 It’s a super friendly group of sewists and a place where you can show your work, ask questions, or talk about fun changes you’re making to any of my patterns (including those from my book). Above: Cotton + Steel quilting weight fabric for Exterior fabric (Pellon 809 fused in place, then cotton canvas basted to wrong side per pattern instructions), Waxed Canvas for Contrast Bottom Fabric, Robert Kaufman Canyon Colored Denim in black (6 oz. weight) for Lining fabric. Quilted the Back Panel per instructions included in the pattern. Above: Lizzy House Printmaking canvas for Exterior fabric (Pellon 809 fused to wrong side), Waxed Canvas for Contrast Bottom fabric, Robert Kaufman Yarn Dyed Essex for Lining fabric. Above: My friend Holly made this gorgeous sample. It’s Leah Duncan’s Lines + Shapes canvas for the Exterior fabric (Pellon 809 interfacing), Robert Kaufman Outback canvas for Contrast Bottom fabric (plus Pellon 809 interfacing), Robert Kaufman Outback canvas for lining (no Pellon SF101 on the lining pieces).